ab62341 recognizes RFP and has been shown to react with tdTomato. Recombinant full length protein corresponding to RFP. Our Abpromise guarantee covers the use of ab62341 in the following tested applications. WB Use a concentration of 0.5 - 4 µg/ml. Detects a band of approximately 35 kDa (predicted molecular weight: 35 kDa). 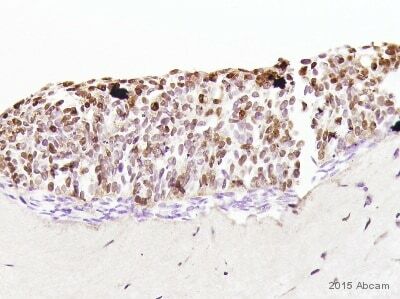 Immunocytochemistry/ Immunofluorescence - Anti-RFP antibody (ab62341)This image is courtesy of an anonymous Abreview. ab62341, at 1/100, staining chicken midbrain cells by Immunocytochemistry/ Immunofluorescence.The cells were paraformaldehyde fixed and blocked with 10% serum prior to incubation with the antibody for 3 hours. An Alexa fluor® 568 goat polyclonal to rabbit Ig, diluted 1/300, was used as the secondary antibody. 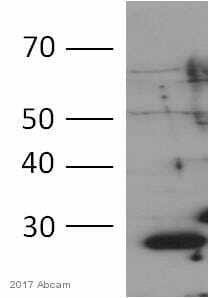 Western blot - Anti-RFP antibody (ab62341)Image courtesy of an anonymous Abreview. Immunocytochemistry/ Immunofluorescence - Anti-RFP antibody (ab62341)Image courtesy of an anonymous Abreview. 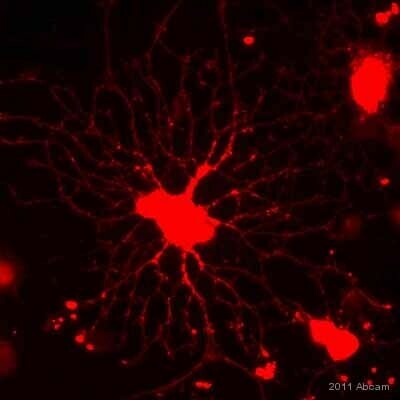 ab62341 staining RFP in rat oligodendrocytes transfected with recombinant human adenovirus type 5 expressing Red Fluorescent Protein (RFP) by Immunocytochemistry/ Immunofluorescence. Cells were fixed with formaldehyde, permeabilized using 0.3% Triton X-100, then blocked with 5% serum for 10 minutes at 25°C. Samples were then incubated with ab62341 at a 1/300 dilution for 1 hour at 25°C. 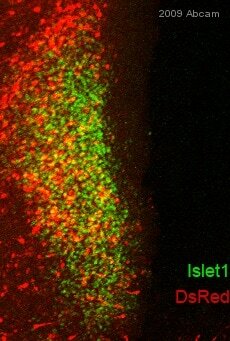 The secondary used was an Alexa Fluor® 594 goat anti-rabbit IgG (H+L), used at a 1/500 dilution. Publishing research using ab62341? Please let us know so that we can cite the reference in this datasheet. 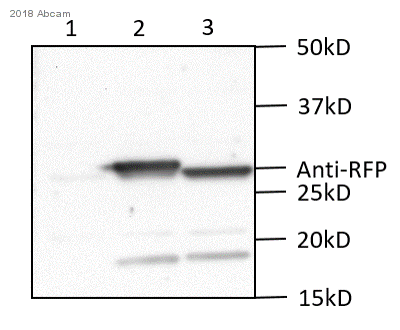 Hello, I have a question regarding this product: Anti-RFP antibody (ab62341) Does this antibody recognize DsRed and mCherry? This product should recognize dsRed as well as RFP, but will not bind to GFP or coGFP. It has not been tested against mCherry however the immunogen only shares a 74% identity with the mCherry sequence (GenBank: AEW43869.1).